(SitNews) Ketchikan, Alaska - While Ketchikan is all abuzz with the arrival this spring and summer of two brand new 154-foot United States Coast Guard cutters, there are still many local residents who remember the long history of an earlier Cutter, the Cape Romain, which spent more than two decades patrolling the Alexander Archipelago. The Cape Romain was the 20th of the 36 cutters built at the United States Coast Guard Yard in Curtis Bay, Maryland. It entered service on Oct. 11, 1955. It was a B class cutter meaning that is was slightly larger, at 105 tons, than the A Class cutters that preceded it. The 95-footers, as they were colloquially called, had aluminum superstructures and steel hulls. The 95-footers replaced the 83-foot wooden patrol boats that had been around since before World War II. Originally, they were designed for anti-submarine warfare, although they all spent their careers primarily as patrol and search and rescue boats. Originally, the ships simply went by their hull numbers, which in the case of the Romain was 95139. Prior to the early 1960s, coast guard cutters under 100 feet in length were not named, but the law was changed in 1964 and they were named after American geographic capes. Becoming known then as “cape” class cutters. The Cape Romain was named after Cape Romain in South Carolina, not far from Charleston. Cape Romain - also sometimes called Cape Roman - is a dangerous spit of land that has had lighthouses on it for nearly 200 years because its shoals extend up to nine miles out into the Atlantic Ocean. The type B Cape Class ships like the Romain were powered initially by four Cummins VT-600 2,200 horsepower diesels, although some were eventually refitted with a pair of Detroit 16V149 diesels that generated 2,470 horsepower. Top speed was 22 knots, but most of the time the ships cruised around 12 knots. At that speed, the Cape Romain had a range of about 1,700 miles. A crew of 15 operated the boat. Although the ships didn't have anti-submarine duties most were still equipped with depth charge racks. The Type B ships like the Romain also had an 1.40 mm cannon and two .50 caliber machine guns. Later cutters including the Romain also received a grenade launcher retrofit. Originally, the Cape Romain was stationed at Point Loma, California, according the Cape Class cutter history on the USCG website. She performed law enforcement and search and rescue duties there until 1962 when she was stationed in Ketchikan. She remained in the First City for 23 years. She was then stationed in San Francisco from 1986 to 1990. 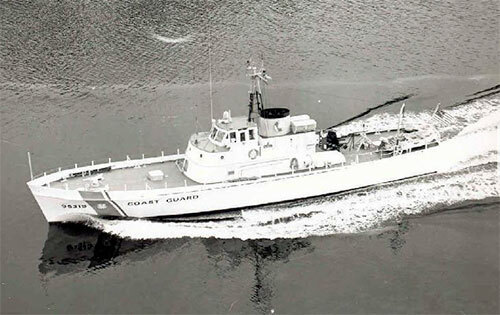 Her duties in Ketchikan were mostly search and rescue and the Cape Romain was involved in a variety of high profile crew rescues, in addition to helping to fight several major waterfront fires in the 1960s and 1970s, according the history website. The Cape Romain was also sent north to help in the aftermath of the Alaskan Earthquake of 1964. During the late 1960s and early 1970s, there were disputes over the US-Canadian border in Dixon Entrance and the Cape Romain was frequently sent on patrols to monitor Canadian fishing activity which was taking place near Alaskan territory at Cape Chacon and Cape Muzon. This led to a very high profile chase in 1971 which the Cape Romain attempted to apprehend a Canadian fishing vessel that was reportedly in Alaskan waters. The halibut boat, Anthony J. was spotted near Cape Chacon. The Romain determined the Canadian boat was within 2 ½ miles of Cape Chacon and in US waters. It ordered the halibut boat to accompany it into Ketchikan and the Anthony J. initially complied. But then, after the Anthony J.’s captain, John Secorde, contacted the Canadian Department of Fisheries, the boat made a break for Canadian waters with the Cape Romain in hot pursuit. The Cape Romain was then impeded in its pursuit when another halibut boat, the Masset Maid, attempted to get between the Cape Romain and the Anthony J. After contacting the US State Department, the Cape Romain broke off the chase because the State Department did not want to force an international incident. That was one of several incidents that happened in the Dixon Entrance area before the two governments agreed to disagree about whether the border followed a latitude line or was dependent upon geographical points. Among the high profile rescues made by the Cape Romain was the bad weather rescue of all six members of the fishing tender Ajax in 1980 off Tongass Rock near the border. When she was transferred to California, the Cape Romain and her crew proved very successful at drug interdiction. In 1987, she captured a ketch with 3.5 tons of marijuana and in 1988, she brought in a fishing vessel that had 2 tons of marijuana. But the Cape Romain's biggest bust was when she pulled over a tug and barge that were found to be carrying 20 tons of marijuana and 33 tons of hashish in 1988. In the 1980s, the cape class was gradually replaced by the 110-foot island class cutters, which are now being replaced by the 154 fast response cutters. At least a dozen of the 95-footers remain active, several in the service of South American countries. In 1989, the Cape Romain was transferred to the US Navy which held onto it for four years as a pilot boat that was called the Vanguard before surplusing it. But the Cape Romain's seagoing days were not over. The boat was donated to the Sea Scouts in Palo Alto, California where it is used as a training ship for the organization. She continues to cruise the San Francisco Bay area in 2017 and has been renamed the Cape Romain by the Sea Scouts. According to the Sea Scouts website, the organization was founded in 1912 and "promotes better citizenship and (improves) members boating skills and maritime safety. " It is a co-ed program for ages 10 to 21. Hundreds of crewmen served on the Cape Romain during its time in Southeast. Gary Hudson was as a first class boatswaim's mate on the Cape Romain for several years. Hudson also spent several years at life saving stations up and down the coast. In 2008, he would publish "The Had To Go Out" the definitive story of the Columbia River disaster in which five Coast Guard sailors died trying to rescue a fishing vessel in 1961. A former Cape Romain skipper, Paul Thomas, went on to become a Rear Admiral and the Coast Guard’s Assistant Commandant. Former commanding officer Guy Goodwin remembered a rescue mission in which the ship came across the sole survivor of a plane crash near Metlakatla. The woman had climbed down a mountain side and reached the beach. Machinist technician third class Chester Ginter said he would remember the bad weather the ship often was forced to go out in. During its time in Ketchikan, the Cape Romain received two citations for meritorious service, one for the rescue of three vessels in distress on Dec. 13, 1978 and one for the evacuation and salvage of the fishing vessel Foxy Tu on May 11, 1976. In 1989, the Cape Romain was transferred to the US Navy which held onto it for four years as a pilot boat that was called the Vanguard before surplusing it. But the Cape Romain's seagoing days were not over.